Domotics is the application of “intelligent” technology to make a home more comfortable and convenient. You may be familiar with the idea under the name household automation, which is much more common; domotics tends to be preferred by robotics and computing specialists and also to be more often used in Europe. Another term sometimes encountered is smart house, used in a European initiative from 2004. Among the many applications that fall under the heading of domotics are sensors that automatically adjust lighting levels to meet the personal preferences of family members. Other sensors could water your plants according to need or vary the ventilation to make best use of outdoor climate conditions. With broadband communications now widely available, in the event of a fire or break-in your house could call the emergency services and explain in detail what was wrong. Some experts have described clever fridges that could read the wireless tags on food, spot when items are getting low and automatically reorder them. 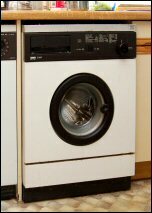 “Intelligent” washing machines could decide for themselves how much cleaning your garments needed. People have been dreaming about the automatic house for decades — it was satirised back in the 1950s by Jacques Tati in Mon Oncle. It is now possible to implement many of the ideas but the cost is too high for most people. Domotics blends Latin domus, a house, with robotics. The earliest example I’ve so far found is from 1994. Domotic systems that use PDAs, cell phones, sensors, and Internet access are being used for everything from alerting emergency services to unlocking the front door, making it possible for all of us to live fuller lives. Buyers of Polaris homes choose “modern” or “rustic” interiors at La Torre, with underfloor heating often part of the standard package and “domotics” — the ability to use your laptop or mobile to turn on air-conditioning or irrigation systems.